With climactic uncertainty now "the new normal" many farmers, gardeners, and orchardists in North America are desperately seeking ways to adapt how they grow food in the face of climate change. The solutions may be at our back door. In Growing Food in a Hotter, Drier Land, Nabhan, one of the world's experts on the agricultural traditions of arid lands, draws upon the knowledge of traditional farmers in the Gobi Desert, the Arabian Peninsula, the Sahara Desert, and the Andalusia, as well as the Sonoran, Chihuahuan, and Painted Deserts of North America. Nabhan offers readers time-tried strategies to adapt and thrive, including: building greater moisture-holding capacity and nutrients in soils; protecting fields from damaging winds, drought, and floods; reducing heat stress on crops and livestock; selecting fruits, nuts, succulents, and herbaceous perennials tat are best suited to warmer, drier climates; and keeping pollinators in pace and in place with arid-adapted crop plants. The book's detailed descriptions and diagrams show you how to implement these desert-adapted practices in your own backyard, orchard, or farm. 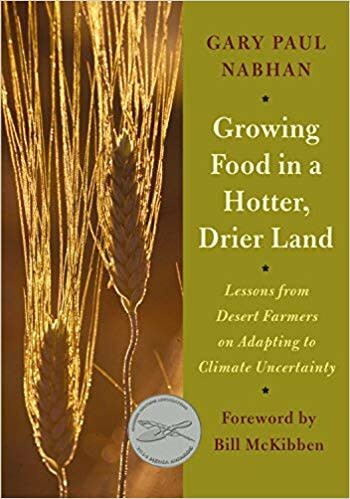 Nabhan also includes colorful "parables from the field" that exemplify how desert farmers think about increasing the carrying capacity and resilience of the lands and waters they steward. This unique book is useful not only for people living in the arid reaches of the Southwest or other desert regions. Its techniques and prophetic vision for achieving food security in the face of climate change may well need to be implemented across most of North America over the next half-century, and are already applicable in most of the semiarid West, Great Plains, and Southwest and adjacent regions of Mexico.